It couldn’t be easier to make your own taco seasoning. I originally found the recipe over at Real Food Enthusiast. But of course I’ve amended it to suit our tastes. Just mix all the dry ingredients into a repurposed glass jar & shake to mix! Now it’s at the ready whenever I need it. I typically use 2 Tablespoons per pound of ground meat. But feel free to scale it down to a smaller quantity if need be to reflect how often you’ll be using it. All these spices were already in my kitchen. Whipping up the taco seasoning took only minutes. It was oh-so-cheap too. And (my fave) there’s NO tiny foil packet to throw away each & every time I use it. It’s all contained in a repurposed wide-mouth glass jar previously destined for the trash by a family member. Heck I even used a cute reusable *Chalkboard Label to easily identify the contents. Yes, of course I’ll share the recipe with you! Add 2 tablespoons of spice mixture to 1 lb of ground meat. 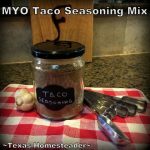 I, also make my own taco seasoning. I don’t eat as much as you do, because Kaleigh has suddenly decided she doesn’t like tacos. She had a touch of the flu one time and blamed getting sick on the tacos. No one else got sick but she hasn’t eaten them since. So I just make small batches and put it in a 4 oz. canning jars. I also make my own pumpkin pie seasoning. It also gets stored in the small canning jars. Super Good Stuff. I make this All the time. My son-in-laws kept asking for me to make more for them, so I finally decided to tape the recipe right to their gifted jar for them to make themselves.